That's 181 elements on 42 booms! There are 7 towers, 6 rotators, 8 beverage listening antennas, and 4 spotting verticals. These numbers are current as of January 2003, but they change frequently. Check back here in the fall to see what we did during the summer. Most towers have antennas for several bands. Some are named for the primary band, and others for the primary direction. The 80M tower is Rohn 55, 95 meters high, guyed at seven levels. The tower has a blinking beacon light at 95 meters, and steady lights at 47 meters. Both sets of lights are automatically controlled by a daylight sensor. 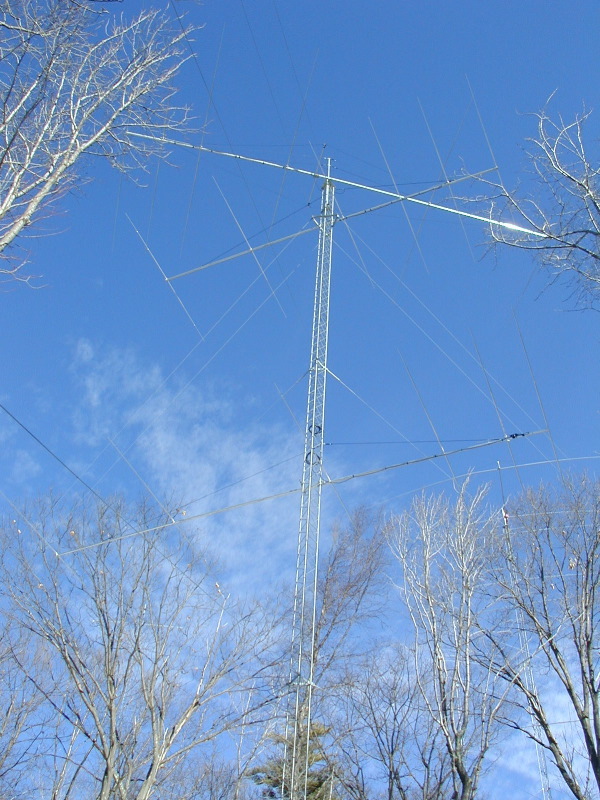 The tower carries three booms made of Rohn 25, at 92 meters, 67 meters, and 46 meters. The booms at 92 meters and 46 meters are 12 meters long; each end of these booms supports the apex of a full-wavelength 80M delta loop. The boom at 67 meters is 15 meters long; this boom supports the horizontal parts of the upper loops. The horizontal element pieces are 27 meters long and mounted 6 meters out from the tower. The 40M tower is Rohn 45, 39 meters high. This tower is guyed at four levels, with a star guy at the top. The top antenna is a 4-element 40M OWA Yagi. The tower also carries three stacked 7-element 10M Yagis fixed toward Japan (the lowest member of this stack isn't shown in the picture), and two stacked 4-element 20M Yagis fixed South. The 20M tower is Rohn 45, 60 meters high, guyed at six levels. This tower carries a stack of four 5-element 20M Yagis, fixed towards Europe. The top Yagi rotates. A 7-el 10M Yagi is mounted on a ring rotator at 57 meters. A 2-element 40M Yagi is mounted at 54 meters, fixed South, and an 8-element 10M Yagi is mounted at 10 meters, fixed towards Europe. 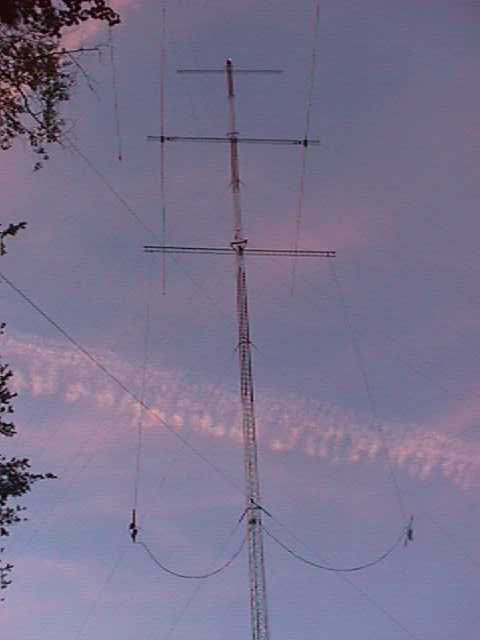 The 15/10M tower is Rohn 45, 60 meters high. This tower carries a stack of six 4-element 15M Yagis, fixed towards Europe, and a stack of eight 4-element 10M Yagis, also fixed towards Europe. The top 15M yagi rotates. A boom 12 meters long near the top of the tower supports the tops of a 2-element 80M delta loop beam, oriented SE/NW. The Africa tower is Rohn 25, 27 meters high. 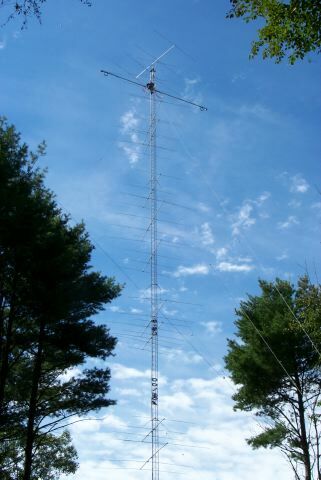 A 5-element 10M Yagi and a 4-element 15M Yagi rotate at the top of this tower. A 5-element 20M Yagi at 21 meters is fixed towards Africa. A 6-element 15M Yagi at 15 meters is fixed toward Europe. The South tower is Rohn 25, 27 meters high. The tower carries a stack of two 4-element 15M Yagis and a stack of two 4-element 10M Yagis. Both stacks are fixed South. The JA tower is Rohn 45, 30 meters high and guyed at four levels, with a star-guy at the top to handle twisting torque from the massive 6-element 20M rotary Yagi. The tower also supports of a stack of two 6-element 15M Yagis fixed towards Japan. Our extreme project for 2002 was upgrading the 160M transmit antenna system from a single vertical to an inline array of three verticals, with endfire gain NE and SW, and broadside gain SE/NW. The designer of this antenna, W1FV, describes the details in a four page writeup. We have two delta-loop antennas systems for 80 meters. The NE/SW system has two elements with apex at 92 meters, above two elements with apex at 46 meters. This antenna system is on the 80M tower. The SE/NW system has two elements with apex at 58 meters. The boom is near the top of the 15/10M tower. All of these antennas are parasitic arrays with driven element and reflector element. The control box for the 80 meter transmit antennas has a row of eight pushbuttons, which select the four primary directions and the four combinations of pairs of directions. The three-position toggle switch at the top left controls which of the NE/SW arrays is driven. The toggle switch at the top right determines whether the upper and lower arrays are fed in-phase or out-of-phase in the Both position, to steer the vertical angle of arrival. The CW/SSB mode switch is on the side of the control box at the top right. Want to see this system in more detail, and hear what it is capable of? Click the photo at right. There are 52 combinations of antenna choices in this system. That isn't an issue when operating, but it makes a difference when recording swept-frequency impedance data for the engineering notebook! Four element OWA at 40 meters on the 40M tower. Turned by North-centered K6NA prop pitch with M2 controller. Two element 402CD at 54 meters fixed South on the 20M tower. 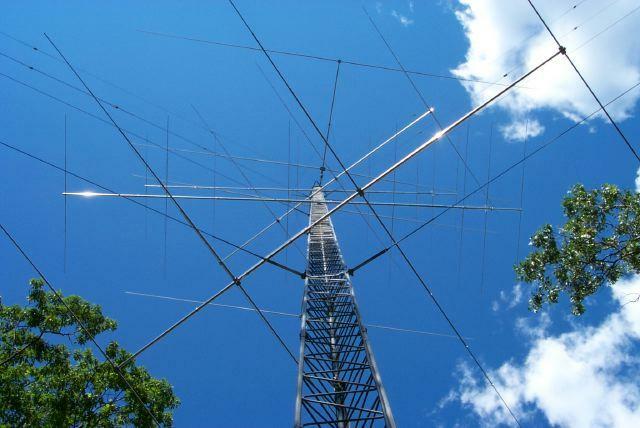 Stack of 4 20M5 M2 5-element yagis spaced 15 meters on the 20M tower. Top 20M5 is turned by North-centered M2 rotator. The bottom three yagis are fixed Northeast and always driven together. A stack control box selects Rotary, 5/5/5 Eu, or Both, and four combinations of phasing that steer the vertical angle of arrival. 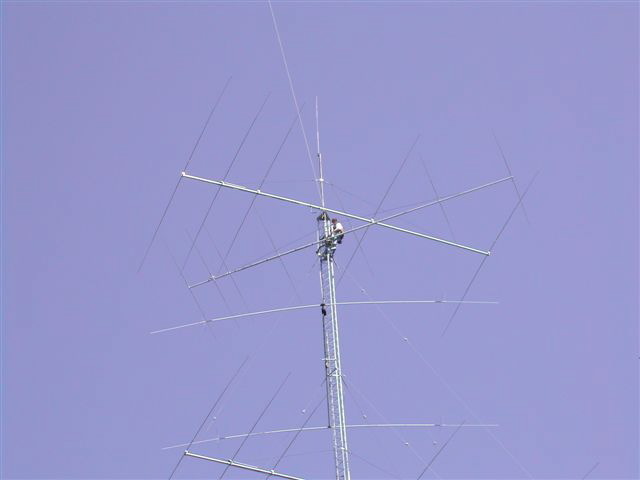 Five element XM520 at 21 meters on the Africa tower, fixed East. Stack of 2 204CD at 28 meters and 14 meters on 40M tower, fixed South. Six element 20M6 M2 at 30 meters on JA tower, turned by M2 rotator. An Array Solutions StackMaster chooses any combination of one, two, three, or all four of these antenna systems. Stack of 6 154CD 4-element yagis spaced about 10 meters on 15/10M tower. Top turned by Yaesu rotator, others fixed Northeast. A stack control swtich selects Rotary, all six, or bottom three. Four-element W2PV at 27 meters on Africa tower. Turned by Yaesu rotator. Six-element 15M6 at 15 meters on Africa tower, fixed Northeast. Stack of 2 154CD 4-element yagis at 18 meters and 9 meters on South tower, fixed South. Stack of 2 15M6 at 28 meters and 14 meters on JA tower, fixed Northwest. A pushbutton selector chooses one of the Northeast antennas. A StackMaster combines this choice with the W2PV Rotary, 4/4 South stack, and/or 6/6 JA stack. Stack of 8 104CD spaced about 7.5 meters on 15/10M tower, fixed Northeast. Seven-elememt 10M7 at 57 meters on the 20M tower. 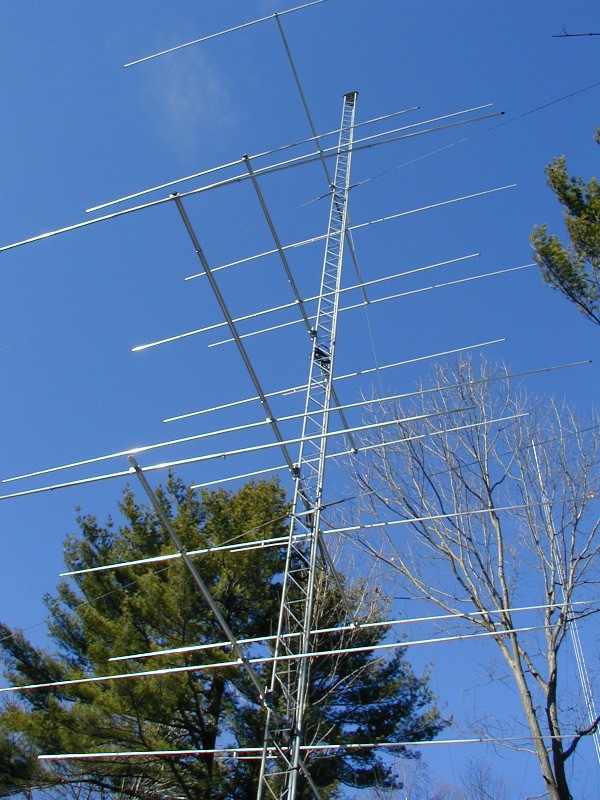 Eight-element W1JR yagi at 10 meters on 20M tower, fixed Northeast. Five-element 105BA at 30 meters on 15M tower, rotates with W2PV 15. Stack of 2 104CD 4-element yagis at 12 meters and 6 m on South tower, fixed South. 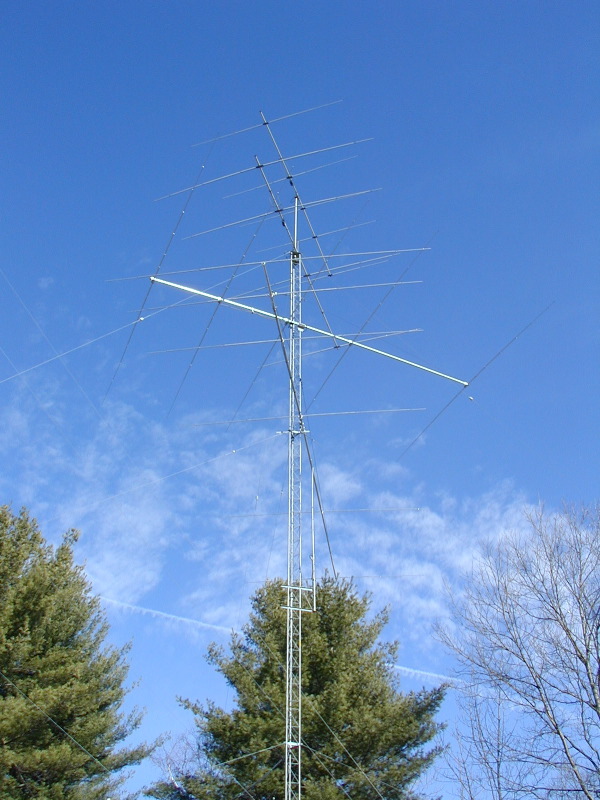 Stack of 3 10M7 7-element M2 yagis at 30, 20, and 10 meters on 40M tower, fixed Northwest. A pushbutton selector chooses the 8-stack or the 8-element Northeast antennas. A StackMaster combines this choice with the 105BA or 10M7 rotaries, the 4/4 South stack, and/or the 7/7/7 JA stack. Four two-wire beverages, 168 meters long, NE/SW, E/W, SE/NW, S/N. Temporary single-band quarter-wave verticals for 40M, 20M, 15M and 10M, located behind neighbor's house 300 meters south of the 40M tower on contest weekends.